Teaching with positive motivation reinforcement, "We care about you and your pet"
A trainer for over 30 years, Joseph has won many American and Canadian Obedience Titles, including two Dog World Awards, as well as his dogs winning American and Canadian In-Breed Championships. Joseph is certified for all training levels, is a certified judge for the U.S. Temperament Test Association, and an Externship Instructor/Mentor for the Animal Behavior College located in California. In addition, Joseph is also a German Shepherd Dog breeder. Lori Daigle has been involved with dogs for over twelve years. 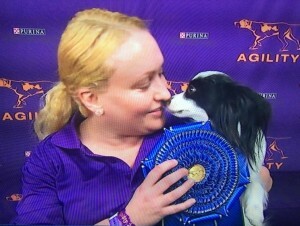 She has lead agility classes for ten years and has been very successful with her Chihuahua, Squish. Lori has attended the AKC Agility Nationals, AKC Agility Invitationals, and the NADAC Championships. Squish has been in the top five AKC Agility Chihuahuas in the country for the past five years. Lori & Squish are currently working towards their third AKC Master Agility Champion Title! In 2015 Lori and her Papillon, Pink, were winners of the Master’s Agility Championship at Westminster, 8″ class. In 2018 Lori’ s Papillon Pink won the 8″ class for a second time at the Master’s Agility Championship. Pink was ranked fifth in the 2018 Agility Nationals. Michael is a graduate of Animal Behavior College and is certified in Dog Training, Shelter Dog Training, The Art of Teaching Private Lessons, and Pet Nutrition. 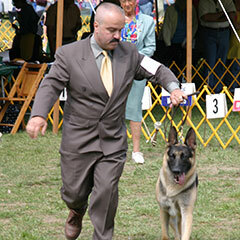 Michael recently became AKC CGC® Approved Evaluator. As part of his study at Animal Behavior College (ABC), Michael mentored under Joseph Mendonca, and since his graduation with high honors from ABC in 2015, Michael has been working side by side with Joseph as a trainer at Joseph’s Obedience Training School. Michael is an active rescue advocate and proud owner of three rescue dogs: Ruby a 7-year-old American Pit Bull Terrier, Tuco a 3- year-old Staffordshire Terrier, and Blue a 5-month-old Pit Bull/ mixed breed. Michael’s heart is in helping rescue dogs and their owners reach their greatest potential through training, so that they can live happy fulfilled lives together. Michelle has been involved in the sport of Rally Obedience since the AKC first started offering Rally-O as a titling companion event. Michelle has successfully competed with two of her dogs in Rally-O for over 7 years now, earning Rally Advanced Excellent (RAE) titles on both dogs. She attends Rally seminars whenever possible to sharpen skills and stay current on recent changes to Rally regulations and exercises. Michelle also trains in and competes in the companion sports of Obedience and Agility and participates with her dogs in sanctioned Earthdog and Barn Hunt tests. Tracey Costa began nose work training with her West Highland White Terrier, Maisie, in April 2010. She has trained with multiple Certified Nose Work instructors as well as a search and rescue expert. She has attended six K9 Nose Work® camps. While there, she was immersed in everything nose work and learned the current training methods from the founders of K9 Nose Work® and other CNWI. Tracey is a Certified Professional Dog Trainer – Knowledge Assessed (CPDT-KA) and a Certified Nose Work Instructor (CNWITM). 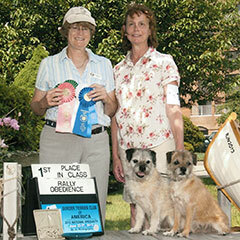 In 2011, her dog Maisie became the first Westie to earn a NW1 title and she placed third overall at trial. 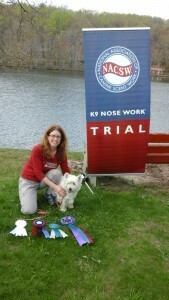 In 2013, Maisie was the second Westie to earn a NW2 title and placed fifth overall at trial. In 2016,Team Maisie became the first Westie to earn the coveted NW 3 Elite title. Tracey is an approved AKC Canine Good Citizen Evaluator and has completed a canine CPR and First Aid course. Tracey is a member of The Pet Professional Guild – advocates for force-free dog training. Many years ago Sheila started training in Obedience with a Doberman Pinscher at the Obedience Training Club of Rhode Island. She currently has two Wirehaired Pointing Griffons, Riley and Declan. Riley has had a fantastic Obedience career including numerous trips to “the Invitational”, now called the Classic and National Obedience Championship. Riley has achieved his OTCH along with many other titles. He is the first Wirehaired Pointer Griffon to achieve the OTCH title. Although he is still capable of handling the rigorous training schedule he used to have, at ten he is now semi-retired. Most of Sheila’s current attention in Obedience is focused on her three-year-old Declan. She uses positive training with her dogs and as a result, they demonstrate to her how much they enjoy their training time with her. Sheila provides her dogs with error free learning, so that they are successful with almost every attempt at an exercise. 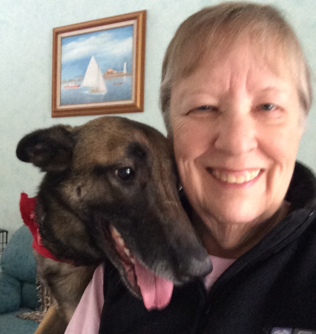 Besides training her own dogs, Sheila enjoys teaching others to train their dogs. She also judges in the Companion Dog Sports Program venue and does woodworking in her spare time. K9 training and competition have been an integral part of Sue’s life. In 2011 Sue retired after 34 years on the job as the creator and manager of the K9 Unit for the Police Department for the Town of Duxbury, MA. She trained patrol and narcotic detection dogs with both passive and aggressive alert.Traveling all over the country, Sue and her police K9s competed in United Schutzhund Clubs of America trials, Police WPO and DPO trials, and United States Police Canine Association trials. Sue and her K9 Bob competed in Germany as members of team USA at the 1989 SV-Bundessiegerprufng in Hannover. Early in his career, K9 Bob gained the number 3 spot in a national DPO competition. His titles included DPO I and II, SchH 1, 2, 3, and Police Service Dog I and II, Narcotic Detector Dog, and Tracking Dog. In 1990 Sue spent a month in Germany with K9 Bob living and training at the German Customs Police Dog School learning their methods of canine scent work. Sue’s passion for dogs continued into retirement. Currently she is a K9 Nose Work® Trial judge for the National Association of Canine Scent Work and a certified K9 Nose Work® instructor, CNWI. Sue teaches the fun sport of Nose Work® representing the NACSW, so that the public can experience the fun of bonding with their dog, while observing the awe inspiring abilities of their dog. 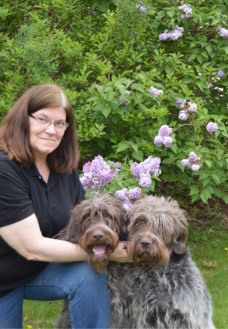 Sue has an established business, Canine Partners of Cape Cod, developed to assist the busy owners of puppies in properly socializing their dogs. Sue is a regular attendee of numerous obedience related and K9 Nose Work® classes and has titled two of her dogs and has a puppy currently in training.